Quintorris "Julio" Lopez Jones  /ˈhulioʊ/ (born February 3, 1989) is an American football wide receiver for the Atlanta Falcons of the National Football League (NFL). He played college football at Alabama, and was drafted by the Atlanta Falcons sixth overall in the 2011 NFL Draft. During his sophomore season with Alabama in 2009, Jones helped lead the Tide to an undefeated 14–0 season, including a victory in the 2010 BCS National Championship Game. Jones attended Foley High School in Foley, Alabama, where he played wide receiver and defensive end for the Foley Lions high school football team from 2004–2007. During his high school career, Jones quickly achieved recognition from outstanding statistics. In his junior year, he caught 75 passes for 1,306 yards and had 16 touchdowns. He participated in the High School Under Armour All-America Game and ran a 4.55-second 40-yard dash at the Baton Rouge Nike camp in May 2007, where he also recorded an event-best 38.6-inch (980 mm) vertical jump. In addition to football, Jones was also a starter on the basketball team and was a standout track athlete. He was the state champion in the long jump (24-2 or 7.40m) and triple jump (47-5 or 14.52m) in both 2006 and 2007. He was named the 2006-07 Gatorade T&F Athlete of the Year in the state of Alabama. He was the state champion in the high jump (6-6 or 1.98m) during the 2007 indoor season. He was named All-county selection in 2005, 2006 and 2007. He won Mr. Alabama Track & Field athlete of the year in 2007. He also competed as a sprinter in 2008, and posted a personal-best time of 11.13 seconds in the 100-meter dash at the Class 6A Section 1 Meet, where he placed second. Considered a five-star recruit by Rivals.com, Jones was listed as the No. 1 wide receiver in the nation in 2008. On February 6, 2008, Jones ended all speculation and committed to the Alabama Crimson Tide on National Signing Day, announcing his decision live on ESPNU. In the first of three years on the Crimson Tide, Jones quickly became an impact player and fan favorite. 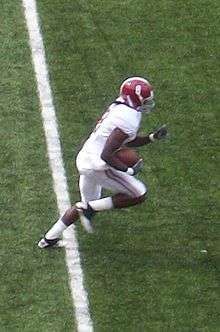 Jones became the first true freshman receiver to start in a season opener for the Crimson Tide, as he started against the Clemson Tigers in the 2008 Chick-fil-A College Kickoff. In the game, Jones caught four passes for 28 yards and a touchdown in a 34–10 rout. In a 41–30 win over the #3 ranked Georgia Bulldogs, Jones had a breakout performance as he caught five passes for 94 yards, including a 22–yard touchdown reception from John Parker Wilson. His first 100–yard receiving game occurred in the annual rivalry game versus Tennessee, as Jones had six receptions for 103 yards en route to a 29–9 victory. However, two weeks later versus #16 LSU, Jones topped his previous performance with 7 catches for 128 yards. His 23–yard reception in overtime set up a game-winning touchdown by John Parker Wilson, giving Alabama a 27–21 victory. In the 2008 SEC Championship Game, Jones caught five passes for 124 yards versus a talented Florida Gators secondary. In the first quarter, Jones caught a 64–yard pass which set up the Crimson Tide's first score of the game. However, Alabama fell to #2 Florida 31–20, giving the Crimson Tide their first loss of the year. On December 8, the Southeastern Conference announced the annual All-SEC first team, second team, and individual awards, as voted by the Associated Press. Jones was named to the second team All-SEC, SEC Freshman of the Year, and the SEC Coaches' All-Freshman Team. Jones finished the regular season with 58 receptions, 924 yards, and four touchdowns. His performance in only his freshman year drew comparisons to NFL greats. ESPN.com reported, "This guy is a unique, rare prospect for the wide receiver position with his supreme blend of size, power, speed and agility. He reminds us of a high school version of Michael Irvin, but at this stage Jones is more explosive and faster." An NFL scout put Jones in the same category as Arizona Cardinals receiver Larry Fitzgerald, who at the time was the second-leading receiver in the NFL. Preceding the 2009 football season, Julio Jones was voted to the All-SEC Coaches' Football Team (first team), one of only four players to be voted such unanimously (along with Florida quarterback Tim Tebow, Tennessee safety Eric Berry and LSU offensive lineman Ciron Black). Jones in a game against Arkansas in 2010. Jones and Alabama again opened their season at the Georgia Dome, this time facing Virginia Tech for the 2009 Chick-fil-A Kickoff Game. However, the Crimson Tide's rushing game dominated the game, led by eventual Heisman Trophy winner and teammate, Mark Ingram. Jones finished the game with four receptions for 46 yards, with Alabama winning the game 34–24. His first touchdown of the season would not come until the end of September, as the Tide routed the Arkansas Razorbacks 35–7 in Tuscaloosa. Jones caught a 50–yard touchdown pass from quarterback Greg McElroy, coming from a trick play, to put Alabama up 14–0 midway through the first quarter. He would finish the game with two catches for 65 yards. After experiencing what some writers called a "sophomore slump", Jones's production increased during the second half of the 2009 season. In a rivalry game against LSU, Jones had his first 100–yard performance of the season. He finished with four catches for 102 yards, including a 73–yard game winning touchdown in Alabama's 24–15 victory. In the annual Iron Bowl game against rival Auburn, Jones was instrumental in capping a come-from-behind victory, catching three crucial third-down passes in an 8-minute, 80 yard drive that fans call "The Drive" to set up Roy Upchurch's game-winning touchdown in the waning minutes of the 4th quarter. Alabama continued through the regular season undefeated at 12–0, working their way to a SEC Championship matchup with the Florida Gators. Jones made the first catch of the game, an 18–yard catch from McElroy. The Crimson Tide won the game 32–13, earning a chance to play for the BCS National Championship in the 2010 title game against the Texas Longhorns. His 23 yards receiving led the Tide in the title game, as the passing game struggled. However, the running game again took over, and led Alabama to a 37–21 victory. Jones ended his Junior campaign with an Alabama record 78 catches and 1,133 yards along with seven touchdowns (fourth in school history). He also had eight rushes for 135 yards and two touchdowns along with five punt returns for 44 yards and five kickoff returns for 129 yards. Jones ended his Alabama career second in career receptions (179) and yards (2,653) in school history and fourth in touchdown catches (15). He had eight career 100-yard receiving games (second in school history). Jones was a first-team All-SEC selection in 2010. Jones playing for the Atlanta Falcons against the Seattle Seahawks in the divisional round of the 2013 NFL Season. On January 7, 2011, Jones decided to skip his senior season of college football. Instead, he chose to declare eligibility for the NFL Draft with teammates Mark Ingram, Greg McElroy, and Marcell Dareus. Jones was later invited to the "All-Star Football Challenge", a skill contest shown by ESPN on February 4. He excelled at the 2011 NFL Combine, posting the longest long jump and the third fastest 40-yard dash among receivers, despite having a broken bone in his foot. The Atlanta Falcons selected Jones with the sixth overall pick of the 2011 NFL Draft. Atlanta traded five draft picks to the Cleveland Browns to move up into their spot and take Jones, giving up their 27th, 59th, and 124th picks from the 2011 draft, and their first and fourth round picks from the 2012 draft. Jones wears number 11, in tribute to the year he was drafted into the NFL. Jones came to terms with the Falcons on July 28, 2011, signing a four-year contract worth $16.2 million, all of which was guaranteed. He recorded his first NFL touchdown on Week 9 of the 2011 season, against the Indianapolis Colts. He finished the season leading all rookies in touchdown receptions with 8, while his 54 receptions for 959 yards ranked him second among rookies in yardage and touchdowns, behind A. J. Green and third in catches behind Green and Greg Little. In 2012, Julio had 79 receptions for 1,198 yards, caught 10 touchdowns, and was selected for the 2013 Pro Bowl – his first Pro Bowl nomination. Jones and fellow receiver Roddy White were the first 1,000-yard receiving tandem the Falcons have had since 1998. The team finished the season with a 13-3 record and earned the top seed in the NFC for the NFL playoffs. 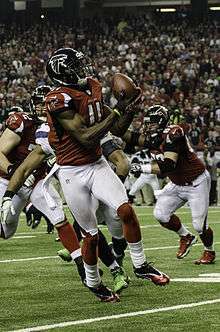 In the divisional playoff game versus the Seattle Seahawks, Jones recorded his first career interception on the last play of the game defending a Hail Mary pass attempt. On October 9, 2013, it was announced that Jones would be out for the rest of the season after fracturing his foot in the week 5 Monday night loss to the New York Jets. On April 29, 2014, the Atlanta Falcons accepted the fifth-year option of Jones' rookie contract, extending his obligations with the team through the 2015 season. On November 30, 2014, week 13 in the NFL season, Jones set a new personal high in receiving yards with 189 on 10 pass receptions. The following week on Monday Night Football (December 8, 2014) he once again broke his single game receiving record, racking up 259 yards against the Green Bay Packers. On August 29, 2015, the Falcons signed Jones to a 5-year, $71.5 million extension with $47 million guaranteed. He ended the 2015 NFL season with 1,871 yards, a Falcons franchise record and the second-highest in NFL history, behind Calvin Johnson (1,964 receiving yards in 2012.) He also had a franchise record 136 receptions, tying with Antonio Brown for the most receptions that season. He was selected to the 2015 Pro Bowl, the third of his career, and earned first-team All-Pro honors. In week 4 of the 2016 season, Jones caught 12 passes for a Falcons record 300 yards and a touchdown in a win over the Carolina Panthers. This made Jones the 6th player in NFL history ever have at least 300 receiving yards in a game. In addition, Matt Ryan threw for 503 passing yards, making them the first quarterback/wide receiver duo to gain 500+ passing yards and 300+ receiving yards in a single NFL game. ↑ Estes, Gentry (2009-11-01). "Who exactly is Crimson Tide Star Julio Jones?". Mobile-Press Register. AL.com. Retrieved 2012-08-02. ↑ Safrit, Miller (2007-11-08). "The Race for Number One: Julio Jones". Scout.com. Retrieved 2012-08-02. ↑ Watts, Tim (2008-02-06). "Jones chooses UA". Rivals.com. Retrieved 2008-12-09. ↑ Stephenson, Creg (2008-08-23). "Top freshman receivers rare in Tide history". Crimson Confidential. Retrieved 2008-12-09. ↑ "Alabama vs Clemson (Aug 30, 2008)". University of Alabama Athletics. 2008-08-30. Retrieved 2008-12-09. ↑ "Alabama vs Georgia (Sep 27, 2008)". University of Alabama Athletics. 2008-09-27. Retrieved 2008-12-09. ↑ Latta, Scott (2008-09-27). "No. 8 Alabama Beats No. 3 Georgia, 41-30". University of Alabama Athletics. Retrieved 2008-12-09. ↑ "Alabama vs Tennessee (Oct 25, 2008)". University of Alabama Athletics. 2008-10-25. Retrieved 2008-12-09. ↑ "Alabama vs LSU (Nov 8, 2008)". University of Alabama Athletics. 2008-11-08. Retrieved 2008-12-09. ↑ "Alabama Crimson Tide vs. LSU Tigers Play-by-Play - OT". ESPN. 2008-11-08. Retrieved 2008-12-09. ↑ "Saban makes victorious return to Tiger Stadium as Bama stays unbeaten". Associated Press. 2008-11-08. Retrieved 2008-12-09. ↑ "Alabama vs Florida (Dec 6, 2008)". University of Alabama Athletics. 2008-12-06. Retrieved 2008-12-09. ↑ "Alabama Crimson Tide vs. Florida Gators Play-by-Play - 1st Qtr". ESPN. 2008-12-06. Retrieved 2008-12-09. ↑ Newberry, Paul (2008-12-06). "No. 2 Fla. stuns No. 1 'Bama 31-20 for SEC title". Associated Press. Retrieved 2008-12-09. 1 2 3 "2008 AP All-SEC Football Team Announced". SECSports.com. 2008-12-08. Retrieved 2009-01-06. 1 2 "2008 SEC Football All-Freshman Team Announced". SECSports.com. 2008-12-11. Archived from the original on February 13, 2009. Retrieved 2009-01-06. ↑ "Julio Jones". ESPN. Retrieved 2008-12-09. ↑ "Julio Jones Rankings, Grade, News, Stats". ESPN. Retrieved 2008-12-09. ↑ McCarter, Mark (2008-11-28). "Jones' production has matched hype". The Huntsville Times. Retrieved 2011-02-05. ↑ "SEC Coaches Preseason All-SEC Team Announced". SECSports.com. 2009-07-16. Archived from the original on July 29, 2009. Retrieved 2009-07-16. ↑ "Alabama Crimson Tide vs. Virginia Tech Hokies - Box Score". ESPN. 2009-09-05. Retrieved 2011-02-05. ↑ "Alabama shakes off kick return, turnovers to overcome Virginia Tech". Associated Press. ESPN. 2009-09-05. Retrieved 2011-02-05. ↑ "Alabama rolls Arkansas as McElroy passes for career-high 291 yards, 3 TDs". Associated Press. ESPN. 2009-09-26. Retrieved 2011-02-05. 1 2 "Arkansas Razorbacks vs. Alabama Crimson Tide - Box Score". ESPN. 2009-09-26. Retrieved 2011-02-05. ↑ Kausler Jr., Don (2010-01-05). "Tide's Julio Jones hard to beat with two good knees". The Birmingham News. AL.com. Retrieved 2011-02-05. ↑ Estes, Gentry (2010-01-04). "Julio Jones' sophomore slump was tied to lingering knee injury". Mobile Press-Register. AL.com. Retrieved 2011-02-05. ↑ "Julio Jones Stats". ESPN. Retrieved 2011-02-05. ↑ "LSU Tigers vs. Alabama Crimson Tide - Box Score". ESPN. 2009-11-07. Retrieved 2011-02-05. ↑ "Crimson Tide hold back Tigers for 2nd straight SEC title-game berth". Associated Press. ESPN. 2009-11-07. Retrieved 2011-02-05. ↑ "Florida Gators vs. Alabama Crimson Tide - Play By Play". ESPN. 2009-12-05. Retrieved 2011-02-05. ↑ "Alabama finishes off Florida for berth in BCS title game". Associated Press. ESPN. 2009-12-05. Retrieved 2011-02-05. ↑ Russo, Ralph D. (2009-12-06). "Alabama rolls, Texas slips into BCS championship". USA Today. Retrieved 2011-02-05. ↑ Durrett, Richard (2009-12-07). "BCS chooses Alabama Crimson Tide, Texas Longhorns for title game". ESPN Dallas. Retrieved 2011-02-05. ↑ "Texas Longhorns vs. Alabama Crimson Tide - Box Score". ESPN. 2010-01-07. Retrieved 2011-02-05. ↑ Mandel, Stewart (2010-01-08). "Alabama made it tough, but champion Tide know no other way". Sports Illustrated. Retrieved 2011-02-05. ↑ Whiteside, Kelly (2010-01-08). "Alabama sidesteps Texas' charge to emerge with BCS title". USA Today. Retrieved 2011-02-05. ↑ University of Alabama Department of Intercollegiate Athletics. "2008–09 Overall Individual Statistics". RollTide.com. Retrieved September 14, 2011. ↑ University of Alabama Department of Intercollegiate Athletics. "2009–10 Overall Individual Statistics". RollTide.com. Retrieved September 14, 2011. ↑ University of Alabama Department of Intercollegiate Athletics. "2010–11 Overall Individual Statistics". RollTide.com. Retrieved September 14, 2011. ↑ Mann, Eric (2010-01-10). "Julio Jones headed for NFL". Baldwin County NOW. Retrieved 2011-02-05. ↑ Smith, Erick (2011-01-07). "Ingram, Jones, Dareus all leaving Alabama for NFL". USA Today. Retrieved 2011-02-05. ↑ "All-Star Football Challenge to feature former Tide receiver Julio Jones". TideSports.com. 2011-01-29. Retrieved 2011-02-05. ↑ low, chris (28 February 2011). "One more time: Green vs. Jones". ESPN.com. Retrieved 28 February 2011. ↑ "Julio Jones Combine Profile", NFL.com, retrieved March 1, 2011 . ↑ Schultz, Jeff (April 28, 2011). "Falcons pick right time to make big move, get Julio Jones". The Atlanta Journal-Constitution. Retrieved April 29, 2011. ↑ Ledbetter, D. Orlando (2011-07-28). "Falcons sign Clabo, Jones and Rodgers". The Atlanta Journal-Constitution. Retrieved 2011-07-29. ↑ Newberry, Paul (2013-01-13). "Bryant's late FG lifts Falcons over Seattle 30-28". Yahoo! Sports. Retrieved 2013-01-13. ↑ "Julio Jones, Atlanta Falcons agree to five-year contract extension". Retrieved 2015-08-30. ↑ "Sporting News names Saban SEC Coach of the Year". Montgomery Adviser. 2008-12-15. Archived from the original on December 16, 2008. Retrieved 2009-01-06. ↑ "Sporting News' college football All-Freshman Team". Sporting News. 2008-12-16. Retrieved 2010-01-01. ↑ Walsh, Christopher (2010-12-06). "Associated Press names three Tide players All-SEC". BamaOnline.com. Rivals.com. Retrieved 2011-02-05. ↑ Kausler Jr., Don (2010-12-07). "Tide has four first-team selections on coaches' All-SEC team". The Birmingham News. AL.com. Retrieved 2011-02-05. ↑ Gould, Izzy (2010-12-14). "AP All-American teams include four from Alabama". The Birmingham News. AL.com. Retrieved 2011-02-05. 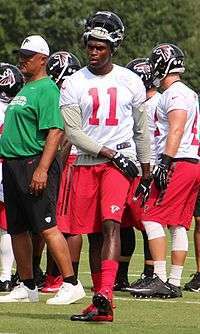 Wikimedia Commons has media related to Julio Jones. "Alabama Crimson Tide bio". Archived from the original on June 5, 2011 – via Wayback Machine.